For Army Staff Sgt. James Harrington, it was a day he thought would never arrive. It had been two and a half years since he last saw his golden-haired, brown-eyed girl, and Harrington had made a point to keep track of the 7-year-old’s travels, even after their lives went separate ways. But standing at Armstrong International Airport in New Orleans on June 26, it was finally time for Harrington, 37, to reunite with Army Sgt. 1st Class Ryky. Ryky is a Belgian Malinois, a type of Belgian sheep-herding dog, and she was headed to the Big Easy on a Southwest Airlines flight from Houston. “Even though we were [apart] for two and a half years, it’s that you don’t forget the dog — and the dogs don’t forget,” Harrington says. Harrington and Ryky, trained as an explosive-detection dog, met in 2008. They went on to do two tours together in the war zones of the 21st century. From September 2008 to October 2009, the pair deployed to Iraq, and from September 2010 to October 2011, they were in Afghanistan. Harrington was Ryky’s handler, she his military working dog. A rank typically is assigned to each military working dog — one higher than the dog’s handler. Harrington’s active duty service ended in January 2012, but Ryky had a few more years in her. So the pair parted ways. He went back to Iraq to work as a K-9 handler with the Department of State and then on to the National Guard. She got a new handler and training at Lackland Air Force Base in Texas, and redeployment to Afghanistan for another four months. Under current law, the military classifies its working dogs as equipment, and those “retired” while overseas aren’t granted transport back to the United States. Organizations are lobbying Congress to change the official language defining military working dogs. As it reads today, Harrington might never have been reunited with Ryky. Military working dogs caught the public’s attention in 2011, when it was reported that one of the members of SEAL Team 6 had four legs and a fur coat. 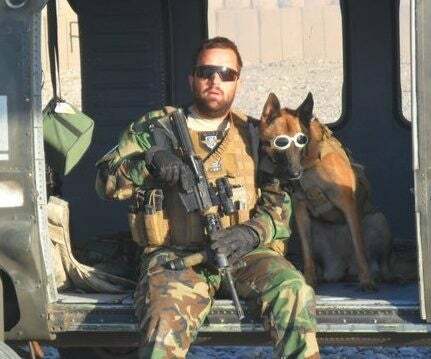 Cairo, also a Belgian Malinois, served alongside the elite special operations forces during the raid on Osama bin Laden’s compound in Abbottabad, Pakistan. 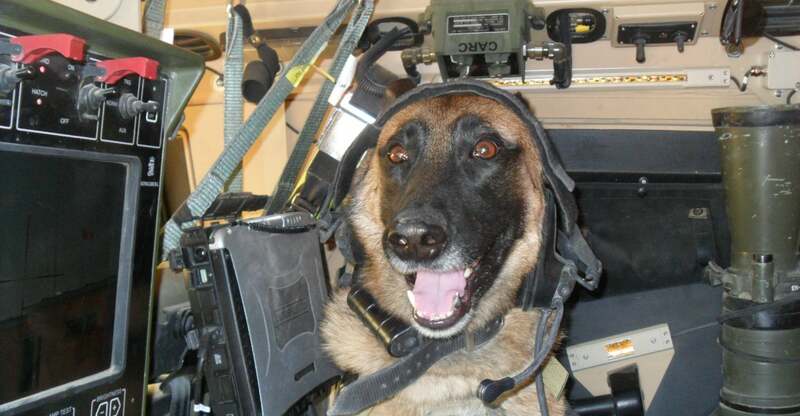 Canines, though, have long been integrated with troops serving overseas. The United States began employing military dogs in 1942. In 1971, they were brought in to combat marijuana use among military personnel stationed in Southeast Asia and to detect explosives. Decades later, in 2005, the Pentagon introduced a new kind of “detector dog” to stem the rising number of attacks on U.S. troops using improvised explosive devices (IEDs) in Afghanistan and Iraq. These canines, or specialized search dogs, can detect IEDs, arms, ammunition and explosives. Then, in 2010, the Air Force’s 341st Training Squadron at Lackland Air Force Base in Texas, which trains military working dogs and handlers, teamed up with the Marine Corps to train Combat Tracker Dog Teams. These dogs, the first of their kind since the conclusion of the Vietnam War, are trained to recognize and follow human targets. 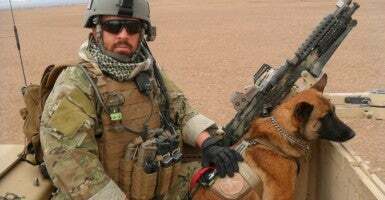 Since the beginning of the Afghanistan War in 2001, the Department of Defense has spent more than $941,000 on acquiring military working dogs, according to an analysis of government contracts. More than 2,500 military working dogs currently serve, roughly 500 deployed at a time. Because of their great ability to seek enemy positions, sniff out IEDs and weapons caches, they’re saving so many lives. It’s allowing mothers and fathers to come home from war and see their kiddos, and sons and daughters to come home from war. These dogs are doing a great, heroic service. A military working dog may save the lives of 150 to 200 soldiers, Ganzert says. Harrington, though, says its hard to come up with a solid number. The Army veteran cites the Kevin Costner film “The Guardian,” in which a Coast Guard rescue swimmer says he remembers not the countless lives saved, but the lives lost, throughout his career. And Harrington has chosen to do the same, counting the number of friends — both humans and canines — lost in battle. That number, he tells The Daily Signal, is one: Sgt. Zainah Creamer, a fellow handler; she trained and accompanied Harrington on missions. It’s difficult not to focus on the lives saved, though. Ryky has been honored for heroic actions on the battlefield. On July 6, 2011, during their deployment to Afghanistan, Harrington and Ryky were riding in the last vehicle in a convoy of three. The vehicle leading the convoy rolled over a particular spot in the road without incident. The second in line hit an IED, and the explosion rocked through Harrington and Ryky’s vehicle as it followed. Two personnel were wounded; one, an Air Force special operations soldier, shattered a leg from big toe to pelvis. Harrington and Ryky sprang into action. Dog and handler cleared a path to the lead vehicle, giving medical personnel access to the wounded. The pair then made a path out of the ambush site and created space for a medivac to land and take out the wounded. For her actions, Ryky was awarded the K9 Medal for Exceptional Service. The medal comes from K9s of the War on Terror Inc., an organization that recognizes the work of K9 teams across the military, the Department of Homeland Security and law enforcement. For military personnel, retirement means returning home to U.S. soil and a grateful nation. But for military working dogs, the end of a career doesn’t lead to a ride home on a military transport, Ganzert explains. The dogs are considered equipment by the Pentagon, and upon “retirement,” despite their assigned ranks, they aren’t treated as canine veterans. Just like a tank or armored vehicle, not all military equipment makes it back to the States, and some dogs are left in shelters in the countries where they end their service. Such is the case with Maxi, a shepherd mix retired in Japan. The American Humane Association is working to bring Maxi home and reunite her with the handler she served alongside, but doing so costs roughly $6,000. As the public learned more about Cairo, the dog from the SEALS’ bin Laden raid, animal advocates called on the Air Force to classify the dogs as something other than equipment — thus allowing them to retire on U.S. soil. The Air Force agreed to do so, but Ganzert says there is little evidence that actions have followed the words. If the secretary of the military department concerned determines a military working dog should be retired, and no suitable adoption is available at the military facility where the dog is located, the secretary may transfer the dog 1.) to the 341st Training Squadron; or 2.) to another location for adoption under this section. However, there is an odd caveat: No federal funds are allowed to be appropriated to provide for such veterinary care. Ganzert praises Congress and the military for taking steps to address retirement of the dogs, but says the issue is the NDAA’s use of the word “may” before the word “transfer,” which, she says, provides a loophole for the military. Just three months after the pair’s heroic mission in Afghanistan, Harrington and Ryky were separated. He left active duty after nine years in the Army; she was assigned a new handler. Harrington, now a staff sergeant in the National Guard, followed Ryky’s military career. He checked in with her new handler at least twice a month. If he had a piece of gear that might be useful, he would ship it. In the summer of 2012, Ryky was deployed back to Afghanistan. After four months, her handler received a non-combat injury. The soldier went home to Fort Carson, Colo., and so did Ryky. A dog’s handler is offered the first opportunity at adoption; when Ryky was retired, though, her new handler passed. In May, Harrington got a phone call saying Ryky was his if he wanted her. The day had finally come. >>> These Veterans Served in Iraq. They Sound Off About What’s Going on There Today. I don’t have any kids, and I’m not married, but from everybody I talk to that does have kids, it’s pretty much like having your first born. In an effort to call more attention to military and contract working dogs (those provided through private companies), the American Humane Association’s Ganzert and representatives of Mission K9 Rescue headed to Capitol Hill late last month. They brought three military working dogs: Ryky, Cila and Thor. They also brought the veterans the dogs served alongside in Afghanistan and Iraq: Harrington, Army Sgt. Jason Bos and Marine Corps. Sgt. Deano Miller, respectively. 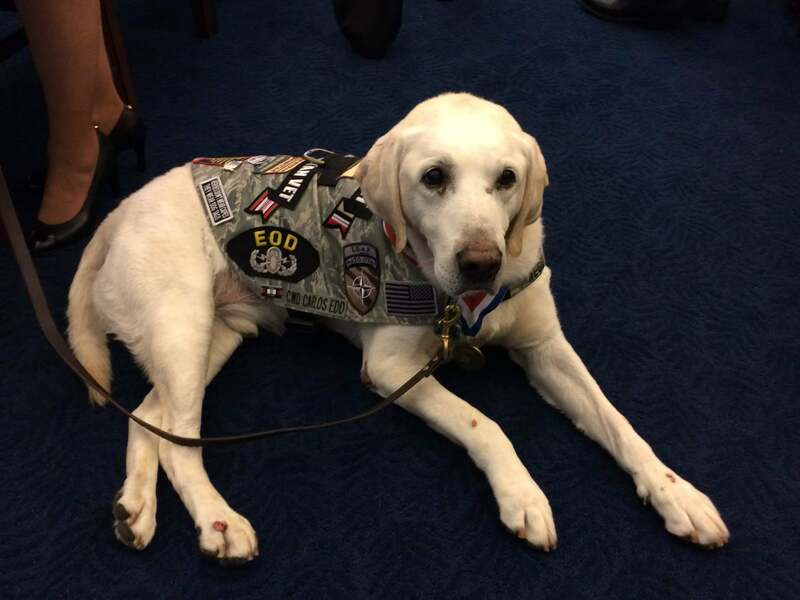 The veteran-canine teams met with Reps. Gus Bilirakis, R-Fla., Marsha Blackburn, R-Tenn., Ileana Ros-Lehtinen, R-Fla., Dina Titus, D-Nev., and Don Young, R-Alaska. The Humane Association and Mission K9 have called on Congress to change the language of the National Defense Authorization Act so that military working dogs are retired only once they are returned to the United States. After the August recess, Bilirakis plans to explore changing the NDAA’s language to require the Pentagon to do that. First, though, the Florida Republican hopes to determine the related cost, since he would prefer not to spend any federal dollars. We want to be fiscally responsible. …The bottom line is we have to help the veterans because they’re the true American heroes. I’d love to see them reunited with these wonderful hero dogs. Ideally, Bilirakis says, Congress would work with nonprofits such as the American Humane Association to cover the cost of bringing the dogs home. In February 2012, Sen. Richard Blumenthal, D-Conn., and Rep. Walter Jones, R-N.C., introduced the Canine Members of the Armed Forces Act, which would direct the Pentagon to classify military working dogs as canine members of the armed forces rather than as equipment. Under the legislation, retired military working dogs would be transferred to the 341st Training Squadron if “no suitable adoption” is available. Neither the House nor the Senate passed the measure in its complete form, but the language — complete with the “may” loophole — was included in the 2013 NDAA signed by President Obama. Ganzert acknowledges that transporting the canines back to the U.S. presents a logistical challenge. It’s easier for the Pentagon to leave a dog where it is, she says, instead of dealing with the red tape of transporting a dog home. That includes coordinating how the animal is going to get back to the States, and who will pick up the dog once it arrives. Harrington and Ryky had no shortage of missions together. During their deployment to Iraq, the pair conducted more than 250; in Afghanistan, 200. Now they live about an hour outside New Orleans, in Mandeville, La. Memories from the battlefield still haunt Harrington, though. The Pentagon reports that more than 155,000 troops experience post-traumatic stress disorder, and each week about 1,000 Iraq and Afghanistan war veterans are diagnosed with PTSD. 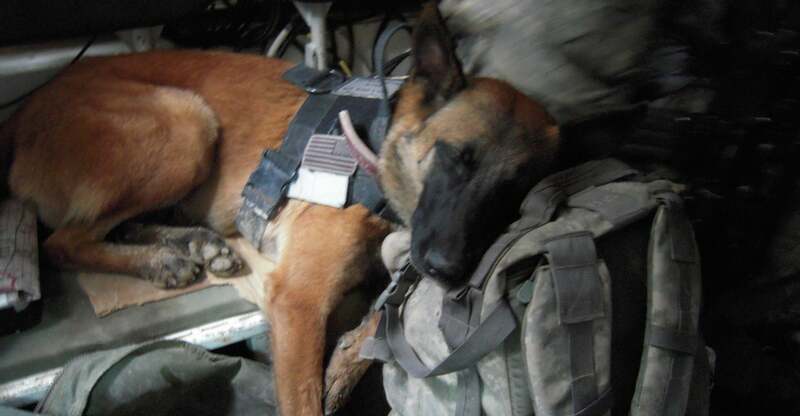 About 5 percent of military dogs used by combat forces present symptoms. The Humane Association and Mission K9 argue that reuniting veterans with their working dogs helps spur healing of the wounds of war. “I don’t care who you are. 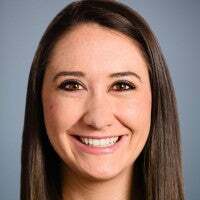 Seeing what [our troops] see over there, what no one should see, they come back broken,” Kristen Maurer, president of Mission K9, says. They protected the dog, the dog protected them in turn. And when they are reuniting with that dog, I see a piece being put back together. And I see a piece of their soul being healed. And you can see it, and you can hear it in their voice, and you can see it in their face. It’s just, to me, the beginning of their healing process. Harrington, who does struggle with post-traumatic stress disorder, says having Ryky by his side is a better remedy than anything the Department of Veteran Affairs could offer. Crowded spaces and remaining in one area for too long can make Harrington anxious. Ryky helps him combat that. Now in training to be a service dog, Ryky has Harrington’s back. Literally. She will stand behind him to ensure no one gets too close. She will rub against him if someone comes within a certain distance. If Harrington remains in one place for “too long,” she’ll press against him and the two will move to an open area. At the very least, reuniting them with their partner seems a small step for a large sacrifice. And make no mistake, such an act of generosity and caring will mean as much to the soldier as it does to their companion. We always say we want to give back. This seems to me an honorable and compassionate way to do that. Mission K9 and the Humane Association are raising money to pay to send retired military working dogs back to the United States. The two groups organize transportation to bring the dogs to an airport where a former handler or adopting family waits. If Congress changes the language of the NDAA to require that the dogs not be retired until after they are returned to the U.S., the organizations intend to arrange for domestic transport and the reunions with handlers.